Economical version of Dazzle. Contains the same ingredients but in lower concentrations. For household machines, use approximately 1/2 cup per load. 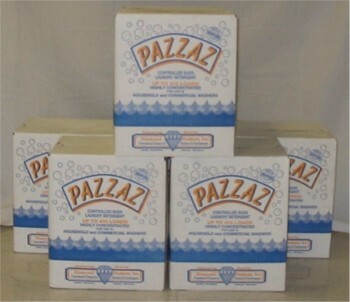 Pazzaz is equally outstanding and economical in commercial machines. Use 1/4 cup for 18-25 Lb. machines, 1/2 cup for 35 to 50 Lb. machines. Use may vary depending upon water conditions. Septic safe.